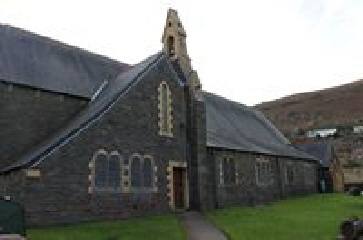 St Dingat’s Church stands on a rise above the Square in the centre of New Tredegar, and behind the village memorial, on land that was presented by the fourth Earl Tredegar in 1894. It was built in the early English style at a cost of £3000. In 1925 the building was enlarged with an additional vestry. The Church has a West Window that depicts the Epiphany while the East Window which is over the Altar, depicts the Ascention of Our Lord and was dedicated before World War One. In 1913, the parish hall was built and proved much use during The Great War as well as in peace times. More recently it saw less use and was at one time put to use as a factory. Greater love has no man than this. The tablet then lists the names of seventy six men, in order of rank, in two columns. 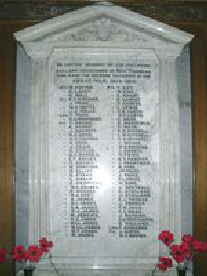 All the names except EIGHT, are named on the New Tredegar War Memorial in James street. The names of those eight men can be seen by selecting the button in the left column.